Baking a simple loaf of bread reminds me of what’s essential. My uncle just bought a Ferrari. I’ve never been in one, but it’d be fun to take a ride round the block. We live in a time of peace, prosperity and excess. I travel along roads every day where people live behind twenty-foot hedges and have full-time staff who cook and clean and garden for them. I share a world, and a world view, with those who want more. I pretend I don’t, that I don’t want more, but sometimes I really do. But then there’s the fig tree. And the figs that we pick day after day. The clafouti made by my husband. A glass of white wine in his hand. The music on. The slowness of his movements because he loves the figs, and he loves the Italian baking dish, and he especially loves us. There are the pomegranates, too. Trees on my parent’s new property that haven’t been properly tended in years. The fruit dangling so high. Me, reaching, reaching to tug down the fruit–my mom holding my belt loop so I don’t slip into the ravine and break a leg. Twelve pomegranates, thirteen scratches–and us so proud. And then the bread. Just one loaf, maybe two. Hours of watching and waiting, for what? For a little food? The act of making, of creating, even just a little food, has become sacred to me. It has become prayer. The sheer doing of it. Even reluctantly, even in a bad mood, or distracted by that disease of wanting more. and maybe another one to give away. 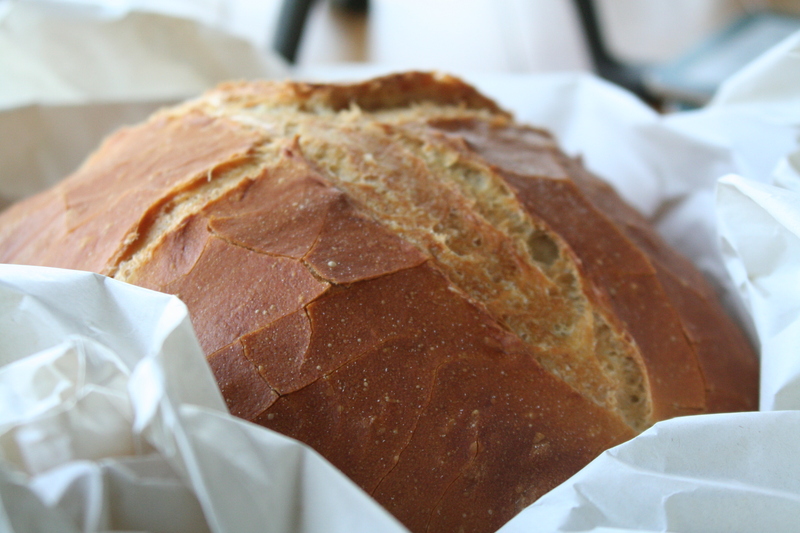 This entry was posted in On living and tagged blessings, essence, essential, one loaf, prosperity, simple by janegmeyer. Bookmark the permalink. Jane, you have a wonderful heart and great perceptions. Bless you and yours. It’s no wonder your kids have turned out so well. great post. from ferraris to pomegranates. love the simplicity of it. Beautifully written (as always). My husband just purchased an antique Mercedes. I’ve never been in one of those and still haven’t because it is being shipped from Boston. But I’m excited to that new adventure for him and us. The simply act of driving in a car with the top down puts my very busy, hard-working husband at peace.